We give you some colourful and cheeky ideas for the rooms of your little ones. But of yourse they work for everybody, you just have to love plants and animals. Maybe this will help you to already get spring vibes..... the new pattern "VOYAGE A AMSTERDAM" is ready and available as cushion and wallpaper. We gave some of our bestesellers a color freshup. Go and get you a refresh for your home. Kind of proud we got that mutch attention from different magazins. We were futured online and offline. Thanks to all of you who love my work. Special thanks to NVC PR for their amazing support. Architektur und Design Magazin Germany found my wallpaper PLONGÉES SOUS MARINE and they obviously liked it.... and made me proud of having a release in the october issue. Where are the Christmas fans among you? Our beloved CHRISTMAS CARDSPECIAL is here. 3 motifs: a small forest scene, Mr. Nutcracker and the Christmas tree. This year we launch a small little Christmas capsule. We have created 2 patterns especially for the winter time: christmassy and wintery, modern with graphic dots, traditional in the style of the French Toile de Jouy. Get your self a cushion or make someone happy with it! Order befor 23rd of nevember to be sure to have it under the christmas tree. 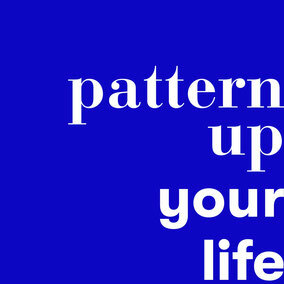 Let MADEMOISELLE CAMILLE design your pattern for your interior. We make custommized patterns and adapt all our designs to your occasion.Let's PATTERN UP YOUR LIFE and make it cosy for the homely season. Florales & Viel mehr got a new wall: we recolored our pattern OMBRES CHINOISES in shades of green to perfectly match to all the flowers. Thank you for these great photos Annemone! This is MONSIEUR TEUTHIDA : a huge calamari found a new home. We designed this wall for the Showroom from Parkett Dietrich in Hamburg. We adapted our design BOUQUET DE VIOLETTES to make this unique wall. 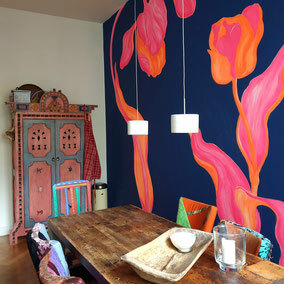 We exactly planed were the flowers have to be, so table, shelf and wallpaper are in perfect harmony. The most talented photographer UTA GLEISER came to visit us in the studio and talk about MADEMOISELLE CAMILLE.